1. Start with business moments. The first step in building a seamless integration structure is to identify key business moments. A business moment is a brief everyday occurence that catalyzes a predictable series of events involving people, data and devices spanning multiple ecosystems and environments. In today's digital business environment, a business moment may actually last only a few seconds. And as the supply chain industry increasingly moves to an Industry 4.0 framework, where data is available in real time, the scope of relevant business moments will continue to expand well beyond the supply chain. By identifying business moments, you also identify instances where it's necessary to combine data sets and sources, including your operational technology, machine logs and even social data. For example, an organization implementing postmodern ERP must use combined application and data integration techniques to integrate SaaS applications with cloud and hybrid environments. 2. 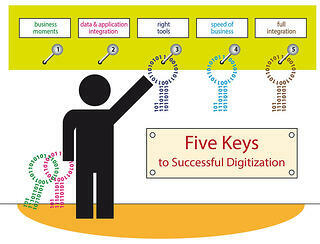 Establish joint criteria for data integration and application integration. Instead, supply chain leaders would do well to seek application and data capabilities that work together to make the entire business more agile. Rather than focusing on the integration requirements of individual applications, use cases or projects, wise supply chain leaders look for broadly applicable, reusable capabilities that build on the interaction of aligned application and data integration infrastructure. That's the natural starting point for identifying shared benefits of application and data integration, such as more positive customer-facing interactions and optimization of shared competencies. 3. Choose the right tools for the job. The best suite of application and data integration "tools" might not address every specialized business need. But it should provide a robust infrastructure that enables interoperability, along with self-service support and end-to-end management. 4. Match your data and application integration to the speed of business. A truly digital supply chain must both process and deliver data at the right moment. As real-time data becomes the norm rather than the exception, this capability will grow even more critical, as will the use of data delivery styles that allow greater granularity (like data visualization). To fully enable business flows and information services, application and data integration leaders must first understand the implications of real-time requirements. From there, it's possible to seek out and identify scenarios where current business flows and existing information provide insufficient value. Online channel optimization is often an example because it may require flexible data latency and process throughput to adapt to business needs in real time. 5. Empower citizen integrators to attain full integration. IT leaders usually think of application integration and data integration as two separate and distinct activities that need to be woven together. But business users often don't make this differentiation. Instead, they often look for simple, seamless ways to use both integration disciplines. These business users who seek do-it-yourself automation of integration tasks are known as "citizen integrators," and they hold tremendous power for transforming the digital business. While every organization is different, following this approach will encourage an organization-wide shift predicated on the convergence of data integration and application integration. Ultimately this HIP framework will enable organizations to fully realize the potential benefits of digitization.